The bottom one has no truth, though. I’m not talking about the truth value of any particular meme. I’m talking about how memes get featured which obviously seems is other than by simple algorithm. I kind of figured that. But I also wanted to remind those who still believe in the meme on the bottom that their delusions are false. Well then we can agree on the first point and and agree to disagree on the second. My ego isn’t offended that not everyone believes as I do. 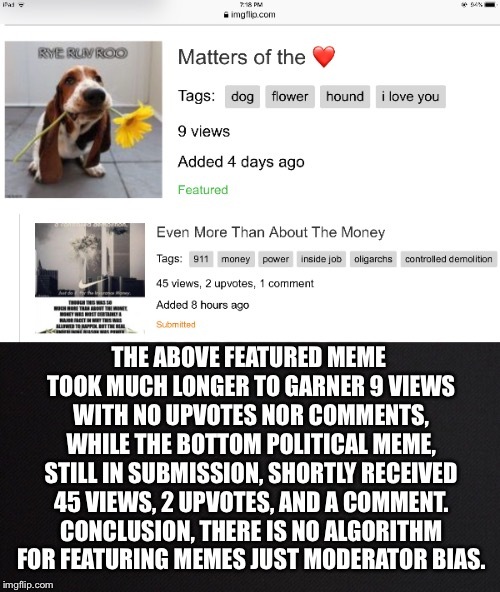 THE ABOVE FEATURED MEME TOOK MUCH LONGER TO GARNER 9 VIEWS WITH NO UPVOTES NOR COMMENTS, WHILE THE BOTTOM POLITICAL MEME, STILL IN SUBMISSION, SHORTLY RECEIVED 45 VIEWS, 2 UPVOTES, AND A COMMENT. CONCLUSION, THERE IS NO ALGORITHM FOR FEATURING MEMES JUST MODERATOR BIAS.